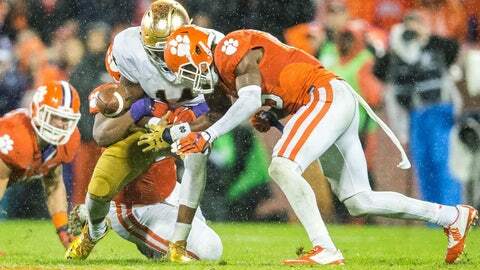 The Fighting Irish could not get the running game untracked at Clemson. Notre Dame football nearly rallied to beat Clemson last week, but that was mostly thanks to the arm of freshman quarterback DeShone Kizer. The Fighting Irish ran for 111 yards against the Tigers and will hope to log something much closer to their 251-yard average that is 13th in the country. This week during a press conference previewing the game against Navy, center Nick Martin had a simple explanation for what the Tigers were doing to stop the Irish. “They put more (players) in the box,” Martin said. Clemson logged nine tackles for loss, something Notre Dame coach Brian Kelly chalked up to multiple factors. Next up is a Navy defense allowing 147 yards per game so far this season, good for 55th nationally.